It’s past the middle of the month. That means that I am late in posting the final numbers on last month’s alternative income. I always wait a few days because tenant checks are coming in and we are paying off mortgages at the start of the month. With the money passing back and forth, it can take a week to let everything settle. However, this time, I’m late, because we’re on vacation at Disney World. I’ll give you more details in March. February is also known for Valentine’s Day. My wife and I don’t celebrate it that much, preferring to take some private time later in the month (or early March as we did this year). Instead, we took the kids and dog to a frugal New York City vacation for the first time. I’ll be randomly inserting some other “life event” pictures from the past month. Regular readers probably know that I use 90% of last month’s Alternative Income article to make this one. Someday, I hope to separate the most of the explanations to a FAQ and then just give you the new details. For those that don’t know the term, “alternative income”, I started using it around 13 years ago to be purposely vague. I needed something to cover the small amount of blogging income I was making, while I growing my peer-to-peer lending portfolio as an income stream. (The P2P worked for a bit, but I’ve soured on it over the last few years.) Blogging income can be very erratic, but there’s a residual nature to it as well. I think alternative income was more passive back in 2007 before social media, podcasting, and video. Today it seems like every blogger talks of hustling (as in moving quickly, not grifting people) and by that they mean “being everywhere.” I feel like the only one dumb enough to just keep writing blog posts… blog posts that often don’t have cool “pinnable” images. In general, I label alternative income everything that comes from passive investment and these side hustles. The best way to think of it is income where you aren’t directly trading your time for money. I think you’ll get the idea as we go along. It’s very subjective though, so your view of alternative income may be very different than mine. To include my investments into this paradigm, I have to fudge the numbers a bit. You’ll see what I mean as we go along… or you can see a more detailed explanation back in January, 2017. 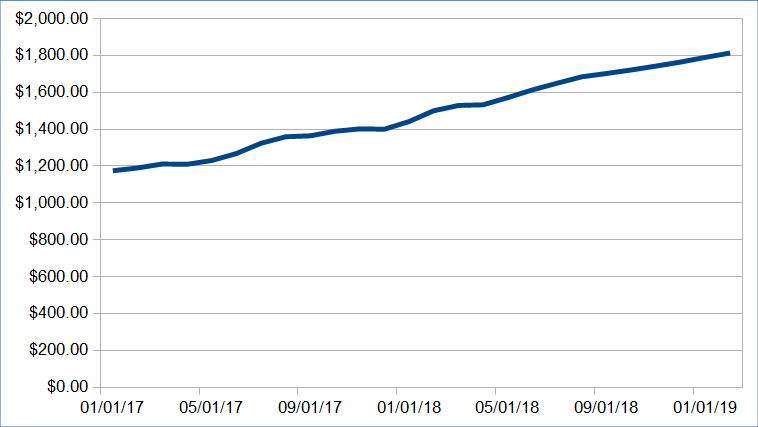 The last month I reported, January 2019, my alternative income added up to $5,074.23 . 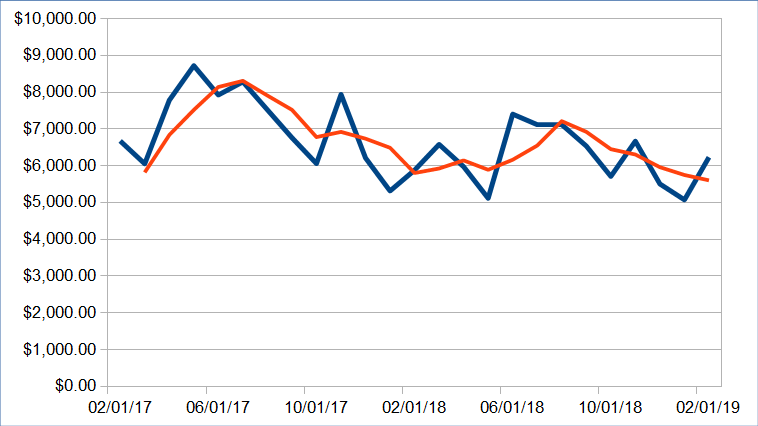 That was a particularly week month since most of it was impacted by a government shutdown, a local gas emergency that went national, and a typical seasonally, weak dog sitting month. In any case, January is ancient history now, so let’s move on to more recent history… February. In looking at our alternative income, I break it down to 3 main sources… each with their own caveats. My “real world” friends have asked me, “What do you do?” I’m not a fan of the question… because it’s simply rude. I feel it’s used to size up or pigeonhole someone. My responses of “software engineer” has received very differently reactions than “dog sitter.” Nonetheless, some response is required. I rotate among all the things that I do. What are those things? If you want a very short list of what I’m doing check out my “Now” page. 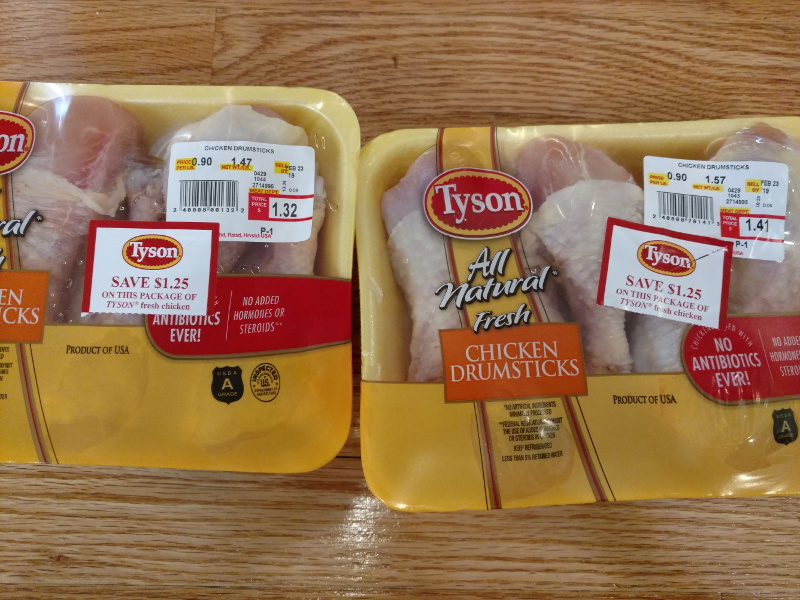 Part of my job is saving money… and this is 3 pounds of chicken for 23 cents! I am the Chicken Man Goo goo g’joob! Check out cheap chicken 1 and Cheap Chicken 2. I apologize for the soapboxing. I don’t publicly break out the difference between blogging income vs. dog sitting income. One impacts the other. When I have a lot of dogs, I don’t have as much time or the focus to blog. When I’m blogging a lot, it’s usually because I don’t have too many dogs to sit. And both are impacted by how much time I spend on the contract side gigs which varies month-to-month. Sitting dogs itself isn’t a time-intensive job… at least with the number of dogs I typically have. However, there is considerably more overhead than you might think between booking dogs and meeting dogs for suitability. The important differentiation with dog sitting is that I can “double-dip” and earn money from another side hustle, such as blogging, at the same time. It’s very different than being an Uber driver. The police tend to frown on blogging and driving. If you are interested, I wrote a very detailed article on how to make money dog sitting. Blogging is usually much more time-intensive than sitting dogs. (The busy summer months are the exception). However, it isn’t directly trading time for money either. If I write an article for the blog today (such as this one! ), I don’t necessarily get any significant money for it. The money I make from blogging now is a direct result of having built a reputation and a collection of nearly 2500 articles over 13 years of blogging. February’s dog sitting was a little above the average of 2018. We had tremendous demand at the start of the month, but lost business when we traveled to the NYC trip ourselves over the long weekend. Still it was a great rebound for the previous month. 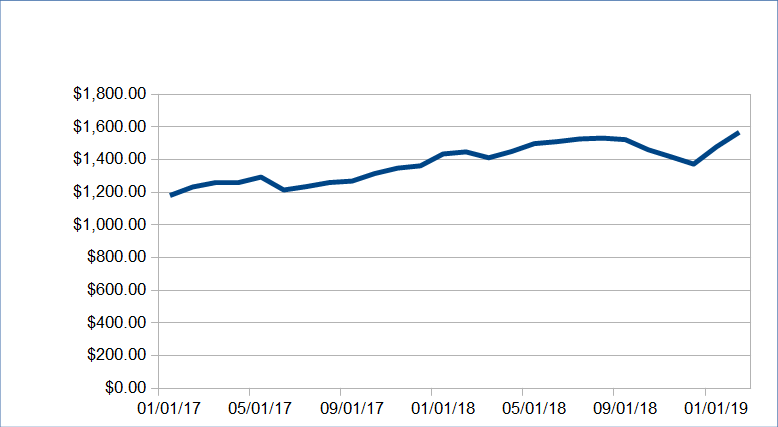 Blogging income in February was about an average month in 2018. That’s a great rebound as well, because January was terrible. While on the topic of blogging, I’d like to add that it isn’t all about the money. I highly recommend personal finance blogging. I wouldn’t aim for creating the greatest blog in the world. Instead, I’d think of it as a way to keep yourself accountable. That’s worked for me. Here’s how to get started blogging with any type blog you might be interested in. For a short month, that extra $1000+ is very nice. Unfortunately, March isn’t looking good for either income. The kids are back on vacation for another two weeks and if we don’t go somewhere they drive me crazy. I’m starting to wonder if they ever go to school. This chart has a new 3-month moving average. Grrr…. I really need to work on this. Here is where I need to fudge the numbers. Sorry, but it’s necessary. We have three rental properties in our real estate accidental “empire”. (“Empire” is in quotes for a reason – it is a joke.) They are all on 15-year fixed mortgages. This means that we don’t make money on them now, but we are paying down those mortgages more quickly than most people. In 9 years, we should be able to collect an estimated income of $40,000 a year (in today’s dollars, after expenses) on them. So here’s why I have to fudge the numbers. For the purposes of this report, it doesn’t make sense to count the properties as zero income. I don’t want this report to push me towards a bad decision. It might make me sell them and invest the money differently just to make the numbers look better. For example, if someone offered you a million dollars in 10 years or $10 per year right now, you’d wait for the million (I hope). However, for this report, the $10 per year would give you better numbers. It’s an extreme example, but it shows how sometimes the short-term plan is the enemy of the long-term plan. 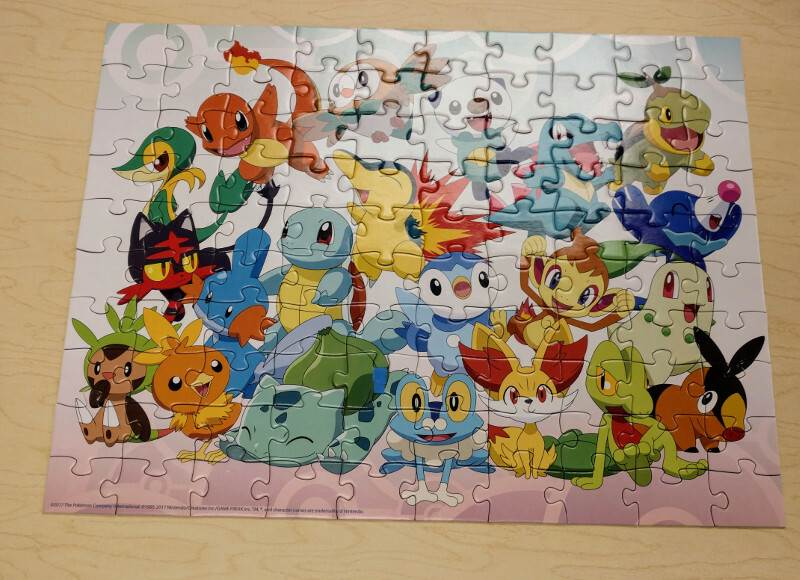 The tremendous teachers at my kids school bought this because my kids love Pokemon. What’s odd about this puzzle? Leave a comment and the first person who is thinking the same as I am gets $10 via Paypal. Here’s how I’ve decided to fudge the numbers. I add up all the properties’ equity and estimated value. Zillow is very accurate for these condos – it has a lot of data points to work with. Next I calculate an equity-to-value ratio. In short, this is the percentage of the property value that we own vs. the bank. Then I calculate the rents of all the properties as if they were owned free and clear. Thus we can say that we are “banking” (in a completely fudgey sense) a percentage of the rent that we would expect to have in the future. Since rents are typically rise in line with inflation over the long term, we don’t have to adjust the numbers. If you are confused (and you probably are), this article on calculating cash flow of cash flowless real estate explains it in more detail… $40,000 now will be $80,000 in the future, but still have roughly the same $40,000 buying power of today. Here are the numbers for February. We have 54.56% of the equity in our properties with an estimated combined rent of $3,325. The rent number is after insurance, property taxes, and condo fees. That’s so we can estimate what we’d really be taking home after expenses. If you multiply $3,325 by 54.56% you get $1,814 in “fudged” monthly alternative income. When I started tracking this (beginning of 2017), we only owned 36.4% of the properties and they had lower rents. The math worked out to $1,174 back then. So in 25 months, we’ve seen the number grow $640/mo. That’s like giving ourselves an annual $7,680 raise until the end of time from where we were just 2+ years ago. As the years march on, the ratio will grow to 100% of the $3,325 monthly inflation-resistant rent. That’s what gets us to that annual $40,000 income I mentioned above. In the previous report, the rental property income was $1,790. This number usually moves slowly and the $24 increase about average. This number only changes if one of two things happen: 1) The properties go up in value. 2) We charge more for rent. I don’t control the housing market. Tenants are typically locked in for at least a year. The monthly paying down of the mortgages creates some equity each month. Like the rental property “income”, I’m going to play a game with the numbers. You can decide if the game is fair. I always appreciate comments! During our brief New York Staycation, we did this. 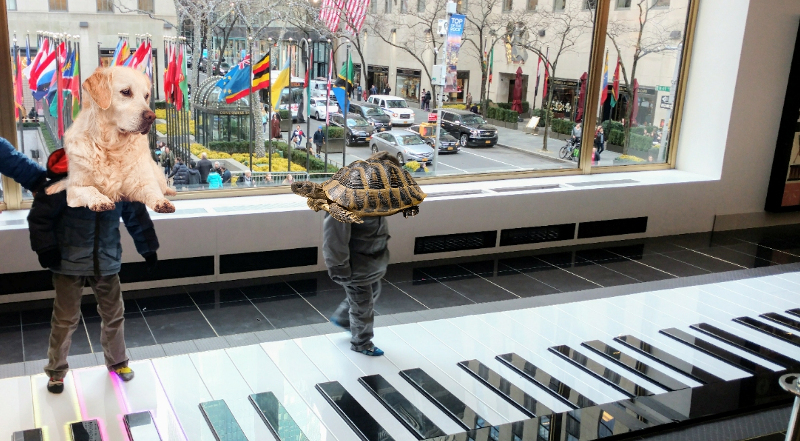 Who’s ever dreamed of playing the piano at FAO Schwartz? Spoiled kids! Even though all this money is in retirement accounts, we could pull the money out and use it. We’d get tax penalties so we won’t do that. However, like the mortgages on the rental property, there’s real value here that I feel should be accounted for. My goal here is to capture the nearly 20 years of mostly maxing out retirement contributions. Just like the rental income, we can pretend what the portfolio would earn if we moved all the money into dividend stocks or indexes. For the sake of pretending, I estimated that we could earn 2.50% in dividends. Most people estimate a 4% safe withdrawal rate, but withdrawal is not our plan here. We are only thinking about the cash that these investments could yield to pay for our living expenses. February was a great month for our portfolios. The stock market continues to rebound from the lows in the year. The numbers would be even better, but I took then during a slight market dip on 3/8. Last month, it was $1,478, so we gained $89 of theoretical monthly money from theoretical dividends. That a new record for us and it’s the first time we have been ahead of the highs of summer of 2018. I don’t have high expectations for the stock market this year, so we’ll see how it goes. Fortunately, I think we’ll be able to grow this number as we deploy new cash into new investments. There’s something really exciting brewing on this front and if it works out, this number could grow sharply. Most people consider rental property income fairly passive income. It’s not, because you have to deal with tenants. However, when things are going well, there might only be “work” every couple of months. For sake of argument, I think we can agree it is “more” passive than writing blog posts and sitting dogs. I spend a lot more time on the later than the former. Of course dividend income is completely passive, so I don’t need to argue much there. At the start of last year dividends and rental income were almost the same. By the end, rental property income bolted $393 ahead of the stock market income. While real estate decisively won the battle in 2018, the dividends are doing much better in 2019. That $393 difference has been cut down to $247 in just two months. Me and my son. 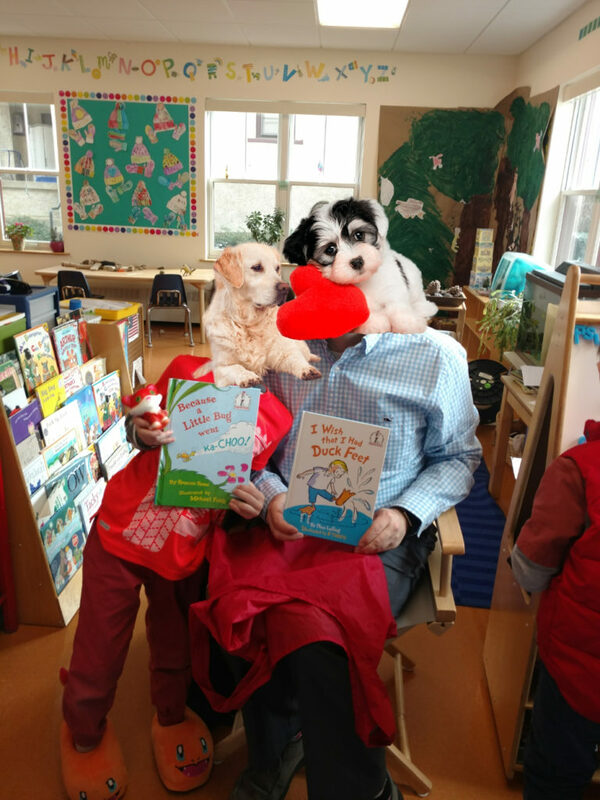 I was the first mystery reader father at my kids’ school. With this kind of financial problem, it’s a no-brainer. One of these books will be featured in a future post. Can you guess which one? The stock market goes up and down fast which makes the dividends fluctuate as well. The rental property income keeps going up because the mortgages are always getting paid down every month. The stock market can move a lot faster than the housing market. In any case, having both of them working for us is great. Last month it was $3,269, so it’s up $112. Last month was an all-time high, so we’re breaking new records. It has grown from a combined $2,354 in January 2017. Since then, this has gone from an estimated annual income of $28,252 from these two sources to $40,578. It’s worth noting that, once again, these are fudged numbers that aren’t “real” yet. However, I’m looking forward to 9 years from now when the mortgages on the investment properties are paid off. Add in stock market growth (of a conservative 4%) and this number could reach $85K a year or more. I have ignored some minor (but important) details. Details such as our investments being in retirement accounts and paying taxes. 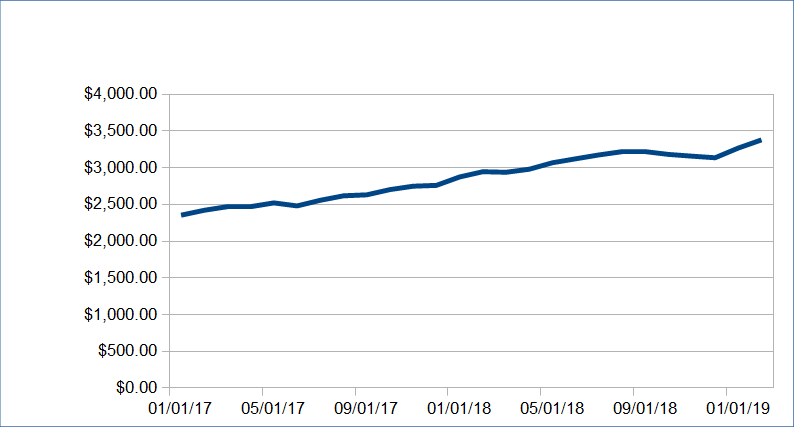 Adding up “dogs and blogs” to the “very close to passive income”, this month we on the investment stuff had $6,231.40 in monthly “alternative” income. That would be $74,776.86 a year. Last year it averaged almost exactly $75,000. That largely hypothetical ~$75K a year on investments, writing on a blog, and taking care of dogs feels a little like a dream. In the long term, we can get by on less than half of that income. That doesn’t include any of my wife’s bread-winning pharmacist income, her potential military pension if she retires next year, or any of that freelance work I’ve been doing over the last several months. 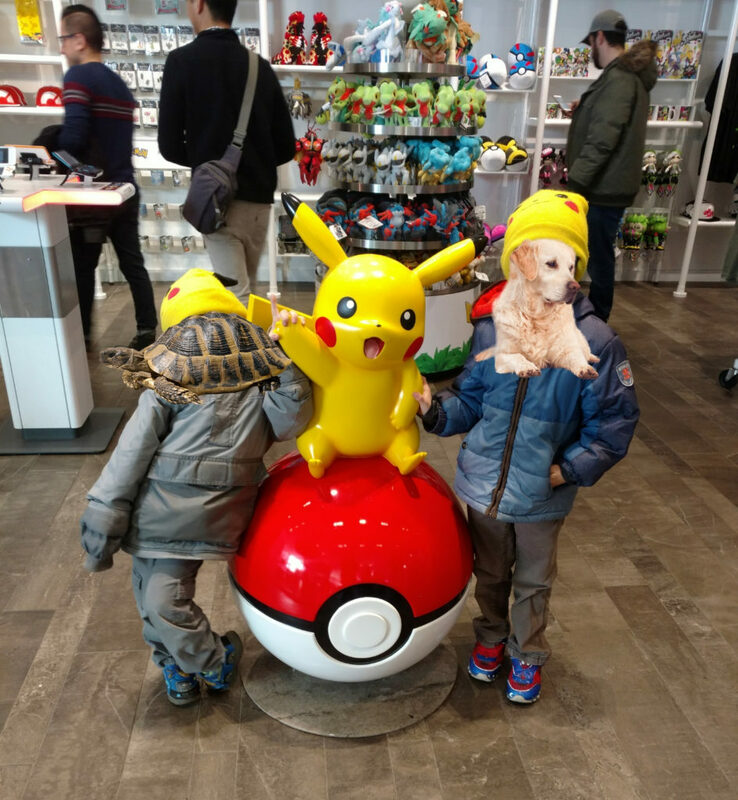 The Pokemon Center in the Nintendo Store in New York City was disappointing, but we made the best of this. This is the part of the article where I mention that I’m still hoping to write a book to boost my alternative income. I had always planned it to be an eBook, but if any readers out there know a publisher, I’d appreciate the hook-up. Seriously… it seems everyone in personal finance is getting a book deal except for me. I think I can make a compelling argument for a book that you’d see in a bookstore… that is if bookstores still exist by the time I’m done writing it. Here’s another 3-month average (in red) chart. Why on only this chart and on the dogs and blogs above and not the others? 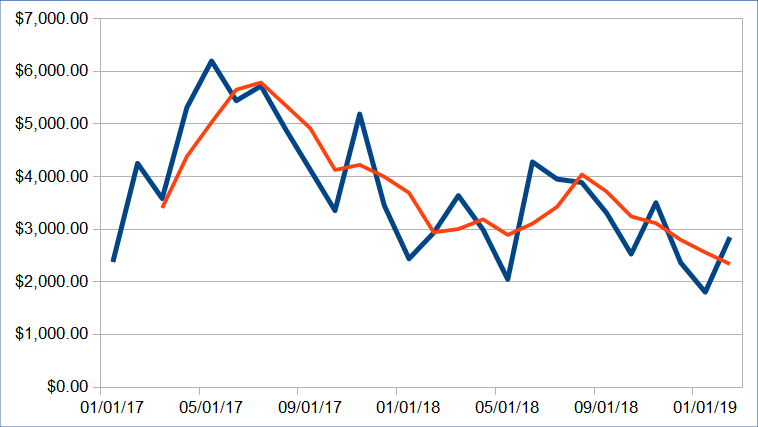 The other charts are slow and steady. Without the roller coaster ride, they don’t benefit from the average. This isn’t very exciting as I don’t share the exact numbers of our net worth. That’s why it’s little more than a footnote here. I use Personal Capital to track my net worth and it makes everything easy. It’s free and you should give it a try. For full disclosure, I might make a few dollars if you do. Due to the strong stock market and steady real estate market, our net worth went up 1.82% in February. That would have been one our best months in 2018 and the numbers are bigger now. For the year it’s up 16.47%, a large percentage of that was based on a website sale that I mentioned last month. I always have to remember that percentages can be weird… Imagine with someone with a net worth of $100 finds a $100 bill on the ground. Instantly it doubles his net worth. As our net worth grows larger, the percentage of growth will come down too. You’d rather have 10% growth of a million dollars than 20% growth of a hundred thousand, right? How was your February? Let me know in the comments. Yes, that’s it. Very excited….saw a lot of Pokémon when the kids were younger and not so much younger. Thank you, got it. Properly managed the kids could have retired on what they spent over the years on Pokémon. We did the NY trip as well many years ago. There’s only 3 real Pokemon on it. Also Wesley beat me to it, but no Pikachu, the OG Pokemon. I think the way you set out rental income makes sense. Only question I have is why don’t you deduct interest expense from the rental income? Isn’t this the part of the income “shared” with the bank? I probably should take out the interest expense, but this helps keep the numbers simple. That rental income number is a little of an estimate anyway. The alternative income is coming along really well. Nice job. It looks like you are still doing well with alternative income overall. You are saving much more than we are and have more investments. I have started my blog three months back, but after reading your alternative income report, I’m really scared now. I want to do blogging full time, but this is looking very hard when you are getting that much income from blogging.